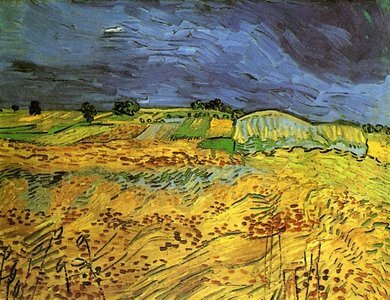 The Fields, painted in 1890, was a part of a series of paintings depicting wheat fields, through which Van Gogh expressed his love for nature, often losing his sense of self in his work. 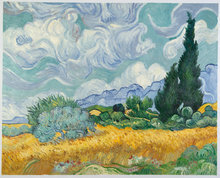 The Fields, now a part of a private collection, is believed to be the last work of Van Gogh. All the paintings under the “Wheat Harvest” series show his enthusiasm to change his art. When he started out, his work was very dull and somber, full of grey and brown. 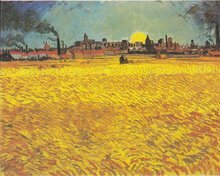 With time, Van Gogh discovered, to his great delight, how much he could express himself through color. Our gifted artists are close followers of Van Gogh. They have studied his method and style in great depth, and their skill shows in their renditions of his art. Van Gogh was a highly troubled man, who was suffering with acute depression. His last words according to his brother were, “(in French) the sadness will last forever”. 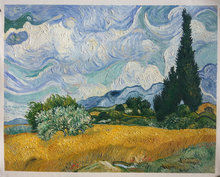 Van Gogh shot himself in the very fields he so beautifully depicted, and eventually bled to death. It is believed that The Fields was completed only 19 days before his death, and hung on his bedroom wall as he breathed his last. Van Gogh’s brother, Theo, was so emotionally attached to the painting that he kept it with him for 20 years, in the family collection. Upon his death, his widow Johanna sold it to a private collector in 1907. Unfortunately, this remarkable work of art, believed to be the final masterpiece of Van Gogh, was last exhibited in the Van Gogh Museum, Amsterdam in the year 2001- as a privately owned work. Many art enthusiasts crave to have a look at this brilliant piece, in vain.